The summer is nearly over. This means we are nearly at the end of the early-bird discount period for The Hands On Literary Festival and Masquerade Ball (early bird discounts end on September 8th). The festival itself is only four months away! Now, perhaps you are interested in attending this year’s festival, but you are not quite sure how to go about “proposing” something. You have questions. Therefore, here are the answers to seven questions, explaining (we hope) everything you might be wondering. 1. What sort of thing should I propose? Imagine a place where dozens of other writers, editors, scholars, and artists spend three busy days together: giving talks, reading their work, and relaxing in the evenings with a glass of wine (or two). What pieces of your own imaginative work would you like other people to hear and enjoy; what kinds of conversation would you like to start? At the festival, we group proposals in four main categories: (1) readings of artistic work, (2) panels discussing a particular topic, (3) performances of plays or music, and (4) events that introduce a particular press or artistic group. But categories aren’t so important. If you can describe it, we can probably weave it into the schedule (at least until the schedule fills up). PS The 2015 festival has a theme: the Politics and Power of Place and Space. If you can connect your work to this theme, all the better. 2. But I’m just one person. I don’t know if I want to be a “panel” all by myself. That’s no problem. The festival’s director, Jeni Wallace, is very experienced at creating small panels from individual people’s submissions. Presenting with other participants is a great way to get to know new writers. 3. Why would I want to attend a conference that might want me as a speaker? I’m nobody, do you understand? NOBODY! Oh, I know the feeling. You have the sense that writers’ conferences are these hierarchial, stressful events, where the size of one’s publication record and the cut of one’s elbow-patched tweed jacket determines everything. However, that’s just not what the Hands On Festival is about. Of course, there’s nothing wrong with owning a tweed jacket, nor with publishing a lot. But I think we all got into this writing thing because we loved it, because we fell in love with reading and imagining and creating. The Hands On Festival is like a magical three days where it seems as though the rest of the world also feels that love, as though sharing ideas and art is the most important thing there is. Last year, many highly successful writers attended, such as American Book Award winner Ira Sukrunruang, International Literacy Award winner Tawni Waters, novelist and memoirist Jennifer Steil, whose second book, The Ambassador’s Wife, is due to be made into television series starring Anne Hathaway — and many, many others. But none of those writers were kept behind locked doors. They read alongside aspiring students. And on New Year’s Eve, just like everyone else, they put on masks and joined in the masquerade ball that concludes the festival. 4. Wait. Why is there a masquerade ball? Do I have to be good at dancing? It’s very casual. Dancing expertise is not required. The ball is a fun end to the festival, a great way to enjoy New Year’s Eve, and it also tends to cement the friendships and new acquaintances that have developed over the last three days. There is a theme to this year’s ball: earth and sea, intended to complement the festival’s focus on space and place. You should interpret this theme as creatively as you like. 5. Okay. When I propose, what then? If your proposal is accepted, then you should register — buy a ticket, in other words. Whether you are presenting or simply attending in the audience, your registration fee allows us to fund the event, pay masterclass teachers, supply evening refreshments and drinks, and book the venue for the New Year’s Eve party. We have student tickets available (they still include entry into one masterclass), and we even offer one-day tickets. If the cost of registering worries you, do get in touch. We can’t promise anything, but we may be able to work something out. 6. But it’s not the registration fee that worries me: it’s the cost of getting to New Orleans, paying for accomodation. What about that? That’s fair enough. While the festival will provide you with breakfast snacks and coffee, and light refreshments for most of the evening events, you do have to physically be in the New Orleans for the duration, and that costs money. We can advise on hotel and Airbnb options, and suggest a great many ways to see New Orleans on a budget. For past attendees, the benefits of the festival far, far outweigh the costs. People make literary and academic connections, forge new writing partnerships, learn about publishing and teaching possibilities, take part in inspiring conversations and come home refreshed, ready to write better than ever before. The festival only lasts three days, but the writing community that it sustains continues through the year. 7. Is New Orleans really that unique? Do I need to see the city? We hope those seven answers were useful. 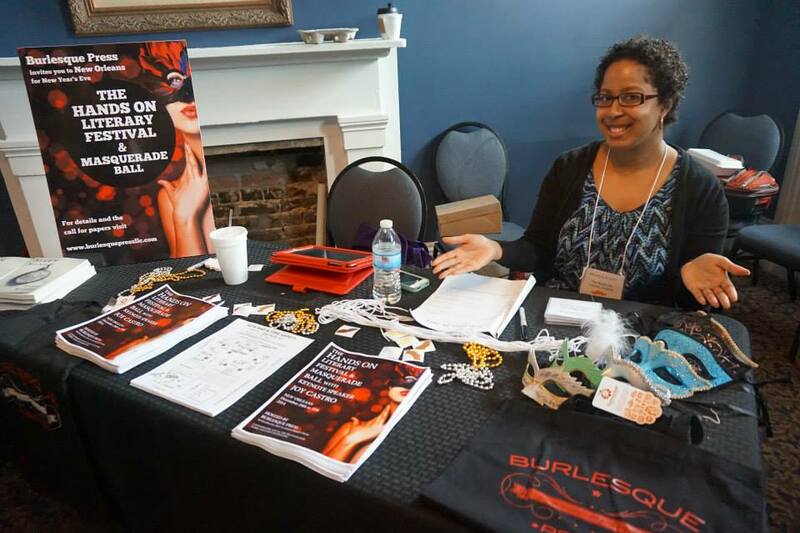 If, by chance, you have an eighth question you’d like to ask, feel free to contact us at burlesquepressllc@gmail.com, or reach out to us on Twitter, at @1burlesquepress. We hope to see you in New Orleans.